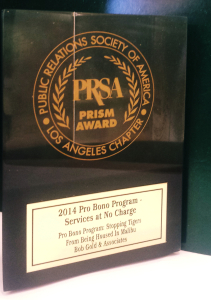 Bob Gold & Associates is pleased to announce that the firm was recently honored as the 2014 PRSA Los Angeles Chapter PRism Award winner for outstanding pro bono campaign. The Los Angeles Chapter annually recognizes outstanding programs and materials created by public relations professionals who work in the Greater Los Angeles area or have completed projects for LA-based clients. The award recognizes the agency’s efforts on a campaign earlier in the year, in which we helped rally oppositions to the housing of tigers near homes in Malibu. 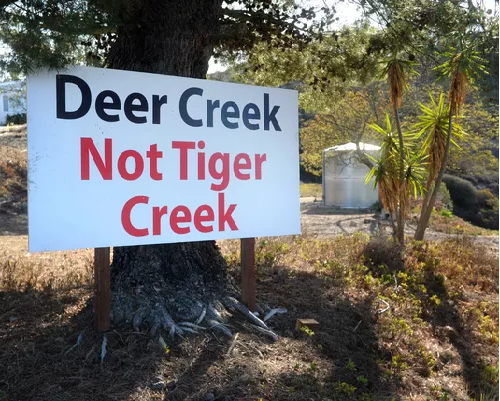 The campaign began in the summer of 2013, when residents of Malibu were informed that the Ventura County Planning Department had given preliminary approval to allow the housing of five tigers in a residential Malibu neighborhood within Ventura County. Residents only had a matter of days to appeal the decision and the situation seemed to be under reported in the community. It was an uphill battle trying to stop one of the world’s most dangerous animals from being housed in their backyards. The agency’s efforts stretched over the course of seven months, beginning with the initial media outreach on August 7, 2013 and lasted until March 20, 2014 when the planning department made its final vote of 3-to-2 against housing tigers in Malibu. Bob Gold & Associates would like to thank everyone who contributed time and effort to this campaign.